In the 1820s, a mill worker named Sam Patch captured the imagination of much of the American public with a series of death-defying leaps. Sam’s daredevil exploits drew large crowds and lots of media attention, aided by his skill at self-promotion. In our celebrity-saturated culture, it is common to think the public’s fascination with show business and celebrities is a relatively recent phenomenon. Certainly the advent of movies, radio, and television in the 20th century increased the public’s awareness of and interest in celebrities, and the rapid growth of cable TV and the Internet in recent years has fueled an explosion in the demand for celebrity news. 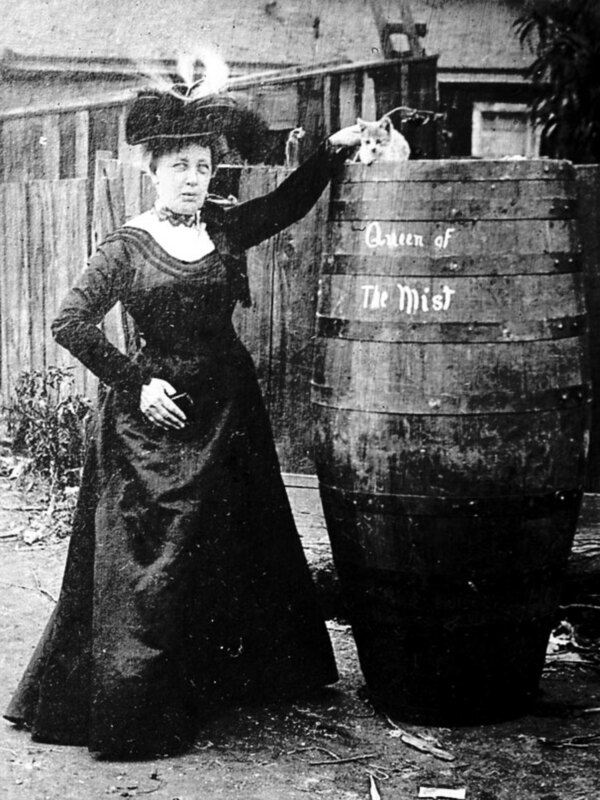 But America’s captivation with showmen and celebrities began far earlier, as Sam Patch's story illustrates. Sam Patch was born into modest circumstances in Reading, Massachusetts, in 1799. When Sam was seven years old, the family moved to Pawtucket, Rhode Island, the premier textile milling town in the United States. Sam, like many other children, got a job in the mills. He became a mule spinner at Samuel Slater’s mill. (A spinning mule is a machine used to spin cotton fiber into yarn.). Like many other boys and young men in Pawtucket, Sam amused himself by jumping off walls, roofs, and other high places. Sam developed considerable jumping skill as he entertained fellow workers by jumping at the Pawtucket Falls of the Blackstone River. Around 1820 Sam Patch moved to Paterson, New Jersey to work in Paterson’s growing textile industry. He became a boss mule spinner at the Hamilton Mills, in the industrial district near the Great Falls of the Passaic River (also commonly known as the Passaic Falls or the Paterson Falls). 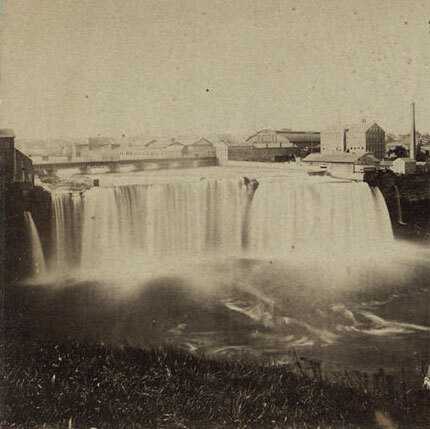 In 1827, an entrepreneur named Timothy Crane began building a bridge across the falls. Crane had purchased land on the far side of the falls that had been picnic grounds for millworkers and their families. He converted the land to manicured gardens and built a bar and restaurant to cater to the wealthier residents of the area. Crane also built a wooden bridge to cross the falls and announced that the bridge would be put in place on September 30. It was a big event: the factories were closed and a large crowd gathered. But Sam Patch stole the show from Crane and his celebration, wowing the crowd by jumping from the cliff at the falls some 77 feet (23 meters) into the swirling waters below. Accounts differ as to the circumstances of Sam’s jump. There were reports that he had planned the leap as a workingman’s protest against Crane and the conversion of the picnic areas to a private playground for the rich. Others said that Sam was drunk and decided to jump at the spur of the moment to retrieve a roller that had fallen from the apparatus being used to move the bridge into place. Some even said that a jilted Sam had jumped for love. Sam himself denied that he was drunk or lovelorn and maintained that jumping was an art requiring knowledge and courage, which he had perfected through practice. In any event, Sam, the “Jersey Jumper,” was energized by the crowd’s enthusiastic reaction to his feat. He jumped at the falls again on the 4th of July 1828, on a day when Crane was mounting Paterson’s first commercial fireworks display. A third jump came on July 19, before a crowd larger than Paterson’s population. 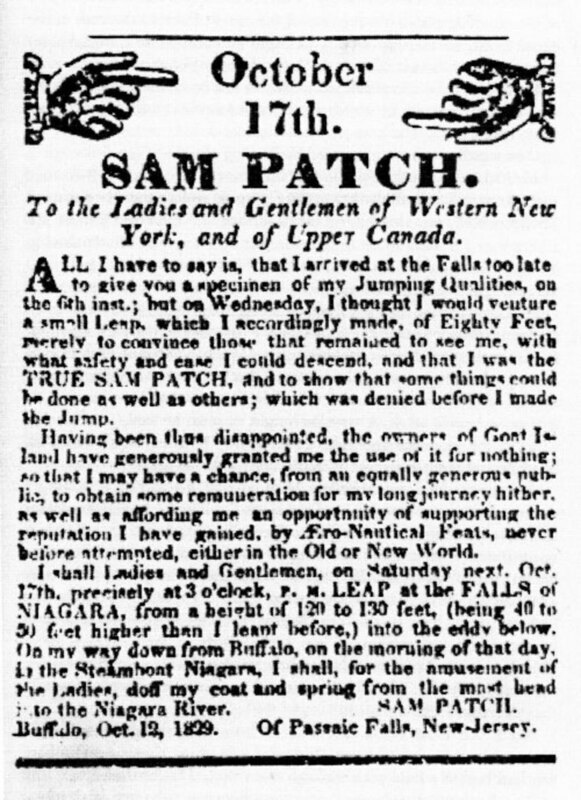 As his fame increased, Sam was offered $75 by a group of hotel owners to jump at the Niagara Falls in October 1829. No one had ever survived a jump at Niagara. Sam’s jump was scheduled for October 6, but he arrived too late to make the jump, so it was rescheduled for the next day. On October 7 he made a successful jump of about 80 feet (24 meters), but the small size of the crowd (and, presumably, the smaller than anticipated amount of the spectators’ contributions) disappointed him. He arranged for a second jump on Saturday, October 17, and distributed promotional handbills to publicize it. 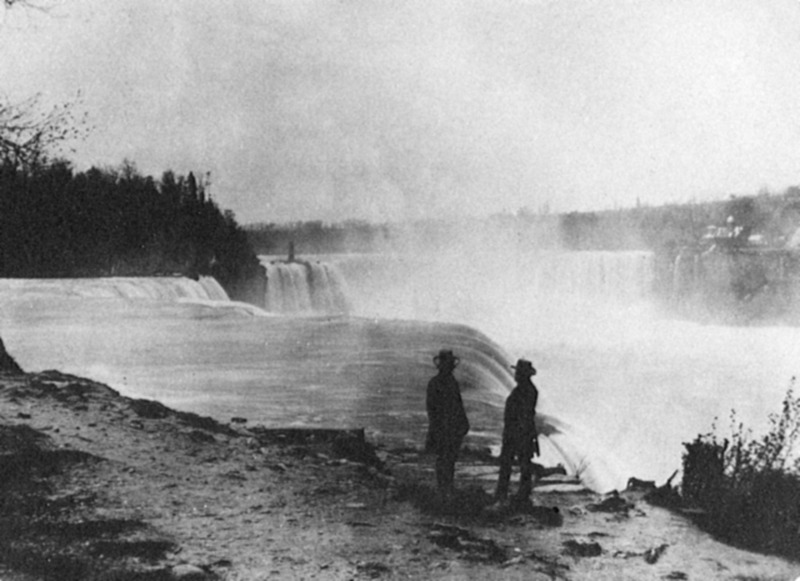 As promised in the handbill, he also jumped from the 50-foot (15-meter) masthead of the steamboat Niagara on his way to the falls. This time some 10,000 spectators witnessed his leap at the falls. Sam thrilled the crowd by jumping about 120 feet (37 meters) from a platform built at the top of a ladder that was chained to the cliff wall, into the churning, aerated waters below the falls. Genesee Falls, Rochester, New York: Higher Yet! Before returning home to New Jersey, Sam planned one more stop on his Jumping Tour: the Upper Falls of the Genesee River near Rochester, New York. 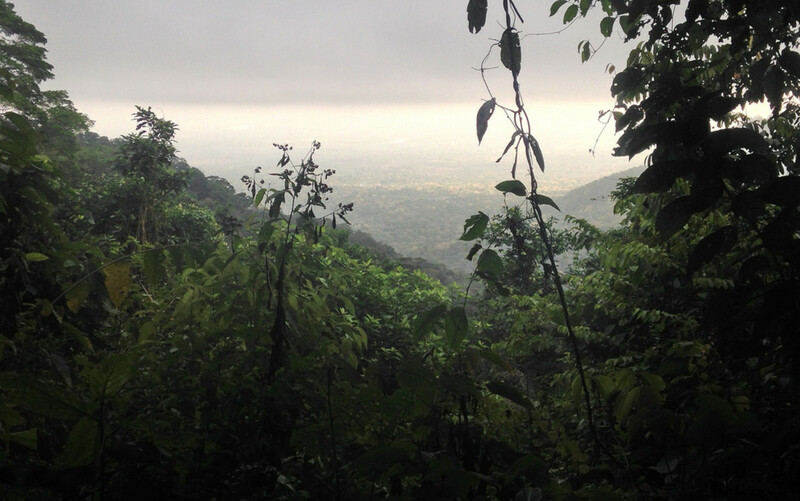 This 97-foot (30-meter) drop was almost as spectacular as Niagara Falls. Sam’s jump was arranged for Friday, November 6, at 2 p.m. Before a crowd estimated at between 6,000 and 8,000 people, he climbed with his bear to a rock ledge in the middle of the river, 100 feet (30 meters) above the water. After first pushing the bear off the ledge and seeing it swim safely to shore, Sam jumped. The crowd cheered as he surfaced in the water below. Apparently, however, the jump did not raise as much money from the spectators as Sam had hoped for. He decided to make a second jump a week later, on Friday the 13th. This would be a more daring feat than the first one: instead of jumping from the rock ledge, Sam had a platform built 25 feet above the ledge, raising the height of his jump to 125 feet (38 meters). 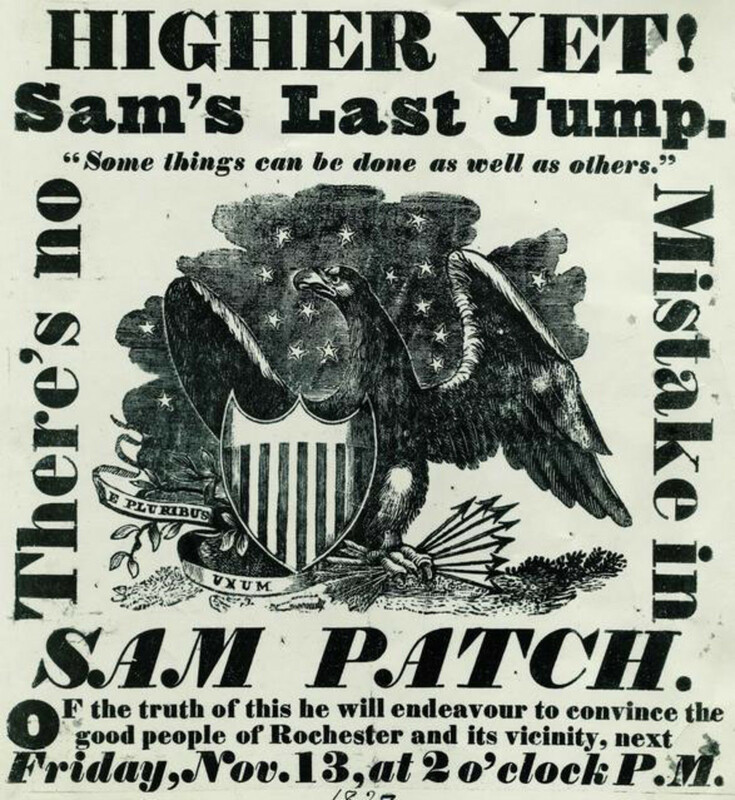 The second jump — “Higher Yet!” — was publicized throughout the area with posters proclaiming “Sam’s Last Jump!” This boast was to prove prescient. In front of 8,000 spectators, Sam jumped into the icy water but never surfaced. Observers noted that he did not jump with his usual erect form, and his body slammed into the water. Many people believed that Sam had survived but had gone into hiding to build his legend, only to make a triumphant reappearance later. But four months later Sam’s frozen body was found downriver near Lake Ontario. 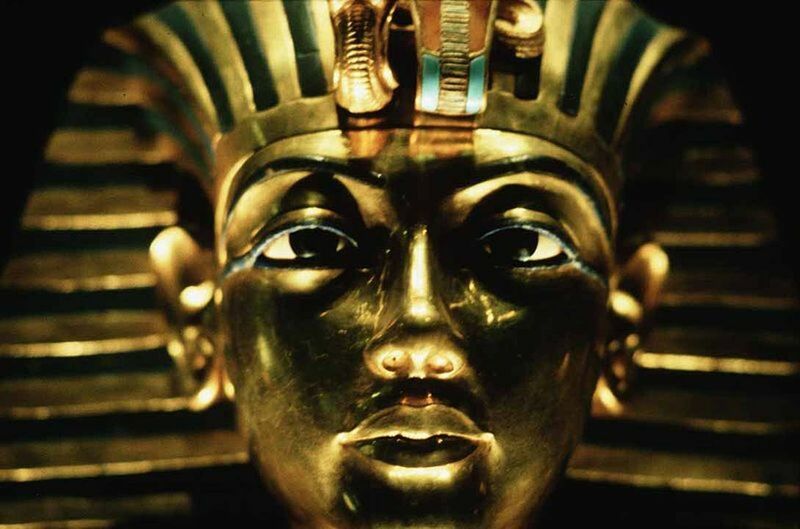 The Anti-Masonic Enquirer newspaper reported on March 23, 1830, that Sam’s body was “perfectly preserved,” and that his black handkerchief was tied around him as it had been when he made his final leap. Sam was gone, but his legend persisted. Jumping — over fences, over store counters — had become a national pastime among young and old, as everyone tried to “do Sam Patch.” His motto, “Some things can be done as well as others,” was a catchphrase around the country. 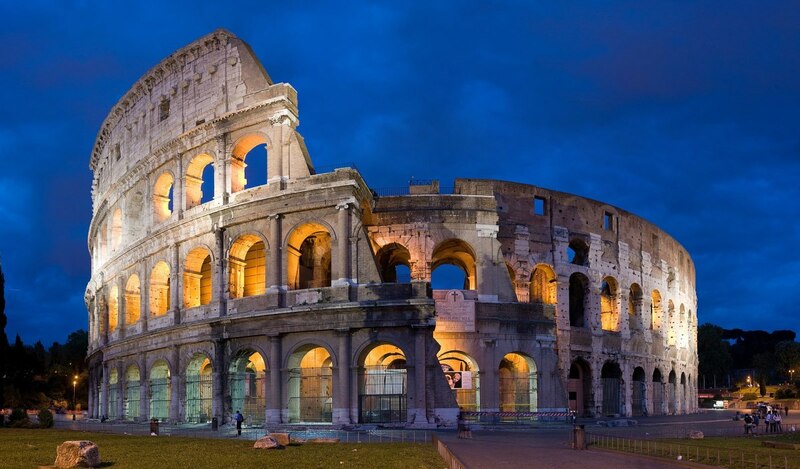 Some preachers spoke out against the “strange and savage curiosity” of the crowds that had gone to see him, with some even suggesting that the spectators were complicit in his death. But by and large, Sam was a folk hero. Even President Andrew Jackson, a folk hero in his own right, named his favorite horse Sam Patch. Sam was celebrated in the theater and in literature. A few years after his death, comedian-actor Dan Marble played Sam in a traveling show “Sam Patch, or the Daring Yankee,” first in western cities and then in Boston and New York. 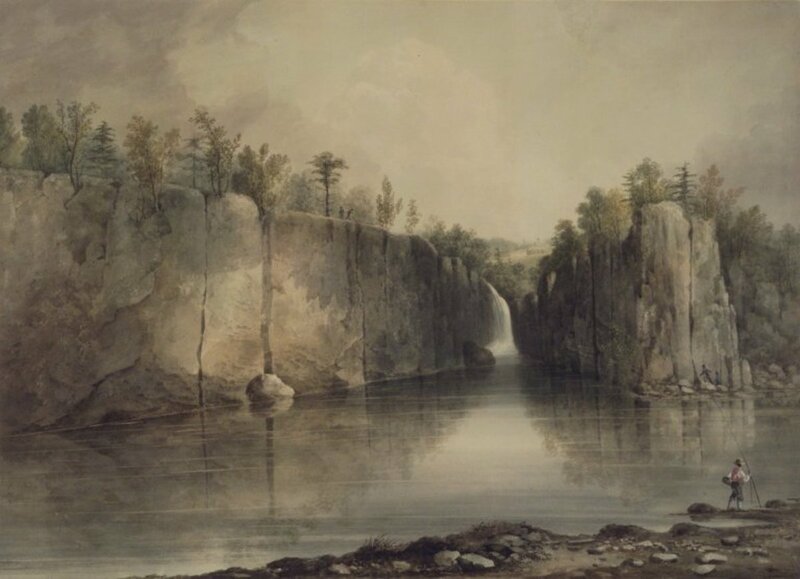 Sam was celebrated in poetry as “The Great Descender, Mighty Patch!” In his 1835 sketch “Rochester,” Nathaniel Hawthorne recounted how Sam, “the jumper of cataracts,” “took his last leap, and alighted in the other world.” Herman Melville and William Dean Howells spoke of Sam in their novels. 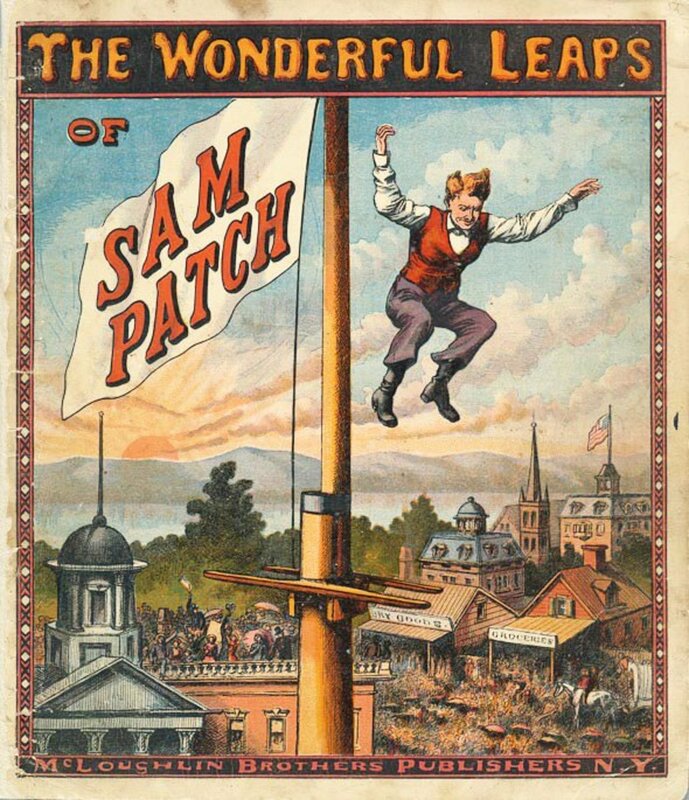 In 1870, the McLoughlin Brothers company published a picture book, The Wonderful Leaps of Sam Patch. For a few brief years in the late 1820s, daredevil Sam Patch was a star. He gave ordinary Americans, especially working class people like himself, a chance to dream of big things. Deeds that were larger than life. The adulation of crowds. Fame. That’s not so different from the allure that show business and celebrities provide today. What do you think motivated Sam Patch to become a falls jumper? It's always interesting to make those connections. Thanks for the comment! Thanks for the history. I have the Patch Family as a branch in my own Winslow Family Tree which is connected to our Jumper Family Tree. How appropriate! Thank you, Rebecca. Sam seems to have been quite the character! Rochester native here: I love Sam Patch's story, so happy someone else appreciates his legacy :) Great job! Thanks, Cogerson. As you say, it was only a matter of time before the bad news arrived. Patch's story caught my interest because his first fame came from jumping the falls in Paterson NJ, only a few miles from me. I'm glad you found it interesting too. Another interesting hub, I was waiting for the bad news on Sam Patch and that extra 25 feet at Genesee River probably did him in as well as improper jumping techniques. I love the fact that the first jump might have been an accident or because of alcohol. Thanks for sharing with me the story of the first Evil Kneivel(wow I spelled that correctly on the first attempt). Voted up and very interesting. @someone - Yes, that's always a question raised about extreme risk-takers. If so, he did get his wish, and his fame outlived him. What an interesting story. Sam sounds like the original Houdini. While they never found him after his last jump, the circumstances didn't sound too good. Thanks for writing a terrific hub.